As a lionness she wanted to protect her children, this is what Esma Abdelhamid (1960) writes (with the help of Marianne Moesle) in this book. It is the story of a mother who does not want to be separated from her three children, no matter what tradition in her male-dominated Tunesian culture says and stipulates. Esma was born in central Tunesia in a traditional household. Her father works with the police force. Her mother stays at home, living a secluded life in a violent marriage. In her late teens Esma is ‘given’ to Abdullah, a man who works in Hamburg (Germany). He is a man of means, that is for local circumstances for he arrives in his own car. Father Abdelhamid arranges the marriage without knowing the man and his background. Nor does Esma know this man. He makes a favourable impression, he is smoothsayer pur sang. This characteristic does change very rapidly once the couple arrives together in the German town Hamburg. His violence and temper is shown very rapidly and very violently. Esma is trapped in her marriage and in her house. She does not work. She does not understand German. She is unable to read and write. She does not know anyone. Abdullah decides everything, even his taste of fashion has to be followed by Esma. Her husband provides her view of the German world. The couple gets 1, 2, 3 children. Two boys and one girl. The boys go to a local school and learn the language and the new culture. They also join a soccerclub. Amal has to live the life of a girl, in the first place. During the times they spend in Tunesia it is impossible for Esma to confide in her parents. Her father would never admit he has made a mistake. Her mother is used to a life of submission to her husband. So why should her daughter be different. Abdullah manages to separate his wife from their children and he brings the children to his brother in Tunesia. In the end Esma starts a court case in Tunesia to get custody. She now gets the full support of her father who does not want to be separated from his grandchildren. 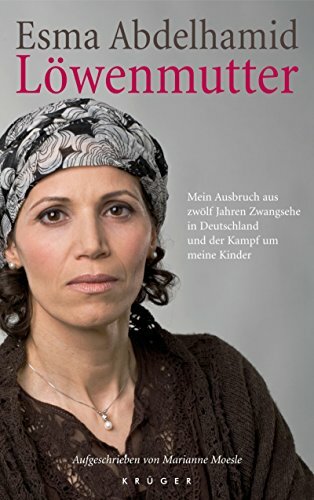 During the long time the custody case is at the court Esma tries to rebuild her life in Hamburg, against all odds. She gets support from local organisations to shield her from her husband and to come to grips with life in Germany, on her own. I will not give away the last developments of this shocking book. A tormented life. A destroyed life. An afflicted life. While reading, especially the end of the book, I thought how is it possible to be raised in a violent family and to build your own marriage and family, carrying all those scars, carrying in your very veins the example your parents have given you. How to break that mould of a mental and often physical prison?